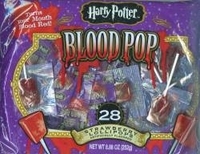 Blood pops Halloween suckers by Harry Potter. These are a square shaped strawberry sucker that will really turn your mouth blood red ! Anyone who enjoys the Harry Potter movies will get a kick out of these lollipops. Even though they turn your mouth red don't worry it won't last forever. If you are dressing up like a vampire this year, make sure to grab a bag of these halloween suckers it will make your mouth look like you have been sucking blood and they taste good too. You get 28 pops per bag.